This biometric 3D hand scanning terminal is ideal for use in environments where employees may have worn fingerprints or wet or dirty hands. This hand scanning clocking in terminal works with our Chronologic Workforce Management System – for more information about how our attendance system works with biometric hand scanning clocking in contact us. This biometric hand scanning terminal for clocking in is ideal for small to medium sized businesses with 50+ employees. Biometric hand scanning terminals are ideal for use in environments where employees may have worn fingerprints or wet or dirty hands which otherwise might obscure readings on a biometric fingerprint reader.The biometric hand scanning terminal takes a 3D scan of the hand, it doesn’t store finger or palm prints. Firstly the employee enters their PIN and then their hand is scanned to verify their identity. This usually takes less than a second. 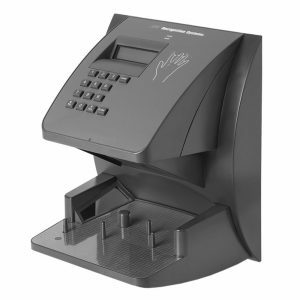 Biometric hand scanning terminals improve payroll accuracy and eliminate ‘buddy clocking’ and time fraud. If you need a totally ‘no touch’ biometric time and attendance solution take a look at facial recognition terminals. This hand scanner integrates with the Chronologic Workforce Management System. Dimensions: 230 x 300 x 230mm (W x H x D). Communication: RS232 (serial) with optional TCP/IP. Installation: Wall mounted with a back-plate. The terminal is hooked onto the bottom of the back-plate and locked in place with a key. It can also be desk mounted. Power Supply: A 12V DC mains plug transformer is included with each clocking machine. ID number: 1 – 10 digits. Optional Hurricane Cover for outdoor installation.